Sligo Tidy Towns aims to enhance the attractiveness of Sligo Town by the provision of well maintained floral arrangements and flower beds, the improvement of it’s buildings, the elimination of dereliction,the removal of litter, the provision of educational opportunities, the improvement of environmental habitats and enhancement of the soft and hard landscapes in order to make Sligo a better place in which to live,visit or work. Sligo Tidy Towns Partnership limited exists to serve the whole community of Sligo. The work of Sligo Tidy Towns Partnership limited could not be achieved without the involvement of a wide range of volunteers and supporting organisations. We regard volunteers as a valuable resource and encourage them to get involved at all levels of the organisation and within all appropriate activities. We aim to train,support and supervise our volunteers and supporting organisations to the best of our abilities,and to act quickly and fairly if difficulties arise. The purpose of this paper is to provide guidance on all aspects of volunteering in Sligo Tidy Towns. It does not constitute a binding contract. It supplements other Sligo Tidy Towns policies and procedures, as well as our definition of volunteering, our mission statement and our value base. These procedures apply to all volunteers who undertake tasks on behalf of and at the direction of Sligo Tidy Towns. The Management committee/Chairman is responsible for ensuring that the policy and the procedures in this document are implemented efficiently and effectively. All other staff and volunteers (including management committee members) are expected to facilitate this process. The Sligo Tidy Towns will consider involving anyone as a volunteer. Individuals should be able to demonstrate a commitment to the aims of Sligo Tidy Towns and may only be placed with Sligo Tidy Towns if their needs as volunteers match the needs of Sligo Tidy Towns. No person who has a conflict of interest with Sligo Tidy Towns will be accepted as a volunteer. Volunteers are appointed to enhance the capacity of any paid staff (including Community Employment Workers) not as a replacement for them. Conversely, Sligo Tidy Towns does not accept the services of paid staff as volunteers. Clear roles are established to differentiate between paid staff and volunteers to foster mutually beneficial and complementary relationships. Volunteers are treated as full members of the Sligo Tidy Towns team. They are treated as equally and fairly as any paid staff and included in it’s functions and decision-making processes wherever practical. Volunteers are provided with appropriate work and have access to such equipment and facilities necessary to volunteer effectively and comfortably. alternative arrangements can be made. opinion must be referred to the relevant Sligo Tidy Towns project team leader or to any member of the management committee of Sligo Tidy Towns. Volunteers must seek prior approval from the Sligo Tidy Towns management/Chairperson before undertaking anything that might affect the organisation. This includes,but is not limited to,statements to the press , TV or radio, joint initiatives with other bodies, and agreements involving contractual or financial obligations. Sligo Tidy Towns respect the volunteers right to privacy and confidentiality. In return, volunteers are responsible for maintaining the confidentiality of all privileged information to which they may be exposed. Any voluntary service is at the discretion of Sligo Tidy Towns.Sligo Tidy Towns may at any time and for whatever reason decide to terminate volunteer’s relationships with Sligo Tidy towns. Similarly,volunteers may at any time ,and for whatever reason,decide to terminate their relationships with Sligo Tidy towns. Notice of such decisions should be communicated at the earliest opportunity, preferably in writing. Volunteers and any paid staff,require a clear and accurate description of the tasks and responsibilities they are expected to undertake.Prior to any volunteer assignment or recruitment effort, a role description must be developed for each voluntary opportunity. This should include a title of the volunteering role ,starting and finishing times,dates,place of work ,name of supervisor and tasks to be undertaken. A role description should be agreed between the supervisor and the volunteer. Volunteers are recruited on a pro-active basis by using publicity avenues that are suitable for the roles that need to be filled.Volunteers are recruited in accordance with Sligo Tidy Towns equal opportunities policy.Volunteers may be required to complete an application form. Applicants may be interviewed by a project team leader to ascertain their interest in and suitability for any role. Sligo Tidy Towns may reject any application as a volunteer if in their opinion the applicant does not have the requisite skills for any vacant role. basis. References may be taken up.Other checks may be made to for example,check professional qualifications. Volunteers should be informed if checks are to be made. If they refuse permission and cannot provide an acceptable reason,their application to work as a volunteer with Sligo Tidy towns will not be accepted. When accepted as a volunteer, a role is agreed between the relevant project team leader and the volunteer. No placements will be made unless the requirements of the volunteer and the relevant project team leader are agreed. All placements are subject to review by the relevant project team leader.A project team leader will meet with a volunteer and discuss the volunteers suitability for their role.After such a meeting, the volunteer may continue in their role,be reassigned to a more suitable role, or be asked to leave.A volunteer may appeal a decision to the Management Committee, whose decision will be final and binding. Volunteers should be informed of all of the Sligo Tidy Towns activities and encouraged to participate in activities which best suit their skills.Any training provided must provide them with the skills necessary to perform their tasks well. The training must be appropriate for the demands of the position and the capabilities of the volunteer. Lines of communication should operate in both directions and should exist formally and informally.Volunteers must have access to all appropriate information,materials and meetings relevant to their assignments.Volunteers must be consulted on all decisions that would substantially affect their volunteering conditions. Each volunteer must have a clearly identified supervisor who is responsible for the day to day management of that volunteer.The Sligo Tidy Towns project team leaders normally takes on the supervisors role,but all team leaders should receive training and guidance on how to involve volunteers effectively in the work of Sligo Tidy Towns. As a general rule,volunteers should receive regular appraisals of their work based on their role descriptions. Appraisals can be either informal or formal. These review the performance of the volunteer,suggest any changes in work style,seek suggestions from the volunteer on means of enhancing the volunteers relationship with Sligo Tidy Towns,convey appreciation to the volunteer and ascertain the continued interest of the volunteer in serving in his or her role. The sessions should also serve as an opportunity to plan future tasks. If appropriate,corrective action may be taken following evaluation session. Examples include of training for an identified training need,the reassignment of a volunteer, or the dismissal of a volunteer. 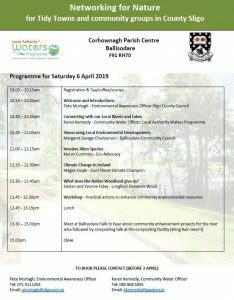 alcohol),theft,misuse of equipment and materials, abuse, including name calling of clients, co workers or employees/volunteers of partner organisations, breaches of confidentiality, failure to abide by Sligo Tidy Towns policies and procedures and failure to complete duties to a satisfactory standard. If volunteers are not satisfied that issues relating to their volunteering are being handled appropriately,they are entitled to have their concerns reviewed by the management committee. The management committee will discuss the issue as soon as practical after receiving a written complaint, and take appropriate action.The Chairman of the management committee makes the ultimate decision having listened to all of the facts. Where possible,informal exit interviews are held with any volunteers who are leaving,either because they have reached the end of their project,or are leaving for some other reason.Interviewsare usually conducted with the volunteer’s ex project team leader and written records should be kept.The session should ascertain why the volunteer is leaving,how they found the volunteering experience and what suggestions they might offer to improve the way Sligo Tidy Towns operates. The offer of a personal reference for future employment etc is to be made to each volunteer. Sligo Tidy Towns endeavours to provide the support necessary to encourage and empower volunteers to make a meaningful contribution and gain significant personal satisfaction from their voluntary work. Support forms part of the regular supervision sessions and gives volunteers a safe setting in which to express themselves,let off steam and discuss how they feel about volunteering. The Sligo Tidy Towns Chairperson and the management committee members will always try to be available to volunteers who require support in other areas that may be affecting their performance. Volunteers provide a unique service to Sligo Tidy Towns,the benefits of which are difficult to quantify.It is essential that their efforts are recognised and acknowledged.Sligo Tidy Towns management are responsible for thanking all volunteers informally on a regular basis for the valuable contribution they make to Sligo Tidy Towns.The Chairman is responsible for ensuring that more formalised recognition takes place at key times. pocket rates of reimbursement will be agreed by the management committee and publicised to effected volunteers. Insurance is provided by Sligo Tidy Towns to cover volunteers working on behalf of and at the direction of Sligo Tidy Towns. Volunteers are encouraged to develop their personal skills while involved with Sligo Tidy Towns and are assisted into assuming additional and greater responsibilities over time,if they desire this. Sligo Tidy Towns monitors and evaluates volunteer involvement on a regular basis and seeks to make ongoing improvements. Constructive feedback on this document is always welcome.I t must be given ,preferably in writing, to the Chairman of Sligo Tidy Towns, who will ensure that it is considered fully by the management committee.